Today begins our countdown to Spring. With only two weeks (and 1 day) until the official start of Spring we are going to get you ready. We are going to touch on Spring trends in fashion and home with a focus on the details like colors, patterns, textures and of course DIY's showing you how to get them for yourself. Let's start this week off with COLOR. Color trends run through all areas of design whether it be fashion, home, even cars. 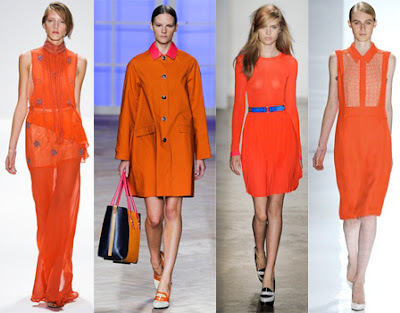 This years Pantone color of the year is Tangerine Tango. For more Spring Color Trends follow our Pinterest board. Of course you can find this stunning and vibrant color in nature as in the beautiful blooms and bright crustaceans pictured above. How about the runway, your neighbors house or your new favorite pair of shoes, (below) aren't those shoes perfect?! But, if you aren't into committing to something so bold, how about a variation of this red/orange hue. Okay, still not convinced? Here are some other Spring trends in color to adopt. What do you think of Tangerine Tango? Do you have a favorite color for Spring 2012?